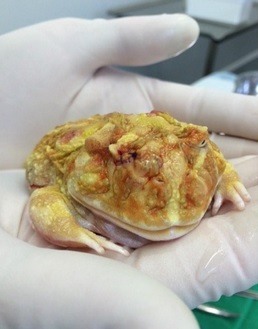 Splat the albino horned frog (sometimes called Pacman frogs because of their large mouth and appetite!) somehow injured his eye, presumably by jumping into one of the furnishings in his vivarium. Unfortunately, the eyeball itself was ruptured and could not be saved so it had to be removed, or enucleated. 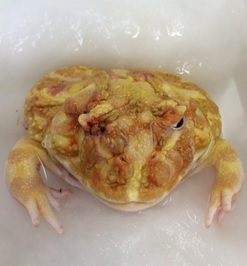 Here he is in an anaesthetic bath containing dissolved anaesthetic drugs that he is absorbing through his skin. Once anaesthetised, I also injected some local anaesthetic around the eye socket and behind the eye itself. He had earlier been given pain relief and antibiotic injections to ensure he was comfortable and to prevent infection. I carefully dissected out the eye from the underlying ocular muscles lining the eye socket. Once the eye had been removed, I placed collagen implant into the socket and packed it well to prevent bleeding and allow the remaining space to fill in with new tissue as it heals. 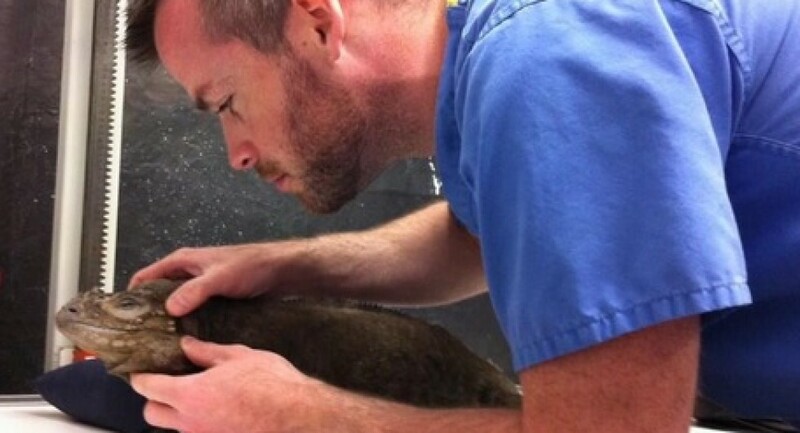 At this point we started to rinse Splat in order to start the process of recovery from his anaesthetic. Here he is after the surgery having closed the eyelids with dissolvable suture material. Now it was time to recover him and wake him from his operation. 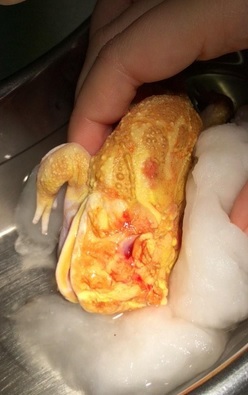 We placed him in clean, de-chlorinated water and irrigated him regularly whilst keeping him warm in order to dilute the anaesthetic residue in his skin and keep him maximally hydrated so that he could recover and wake from anaesthesia. He recovered well, and went home the next day having been given another pain relief injection and oral antibiotic drops for the owner to administer. Here’s hoping he will be fighting fit in no time! 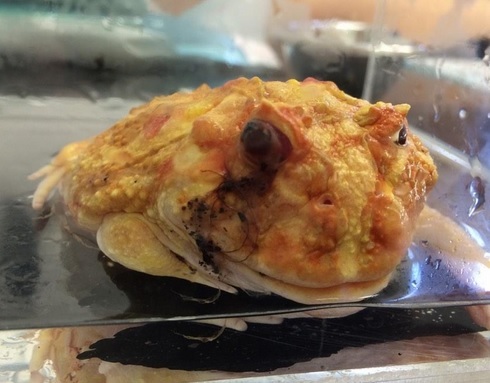 I often get asked about the zoonotic or transmissable disease risk from pet reptiles, and this is a good summary of the situation with Salmonella in particular and disease transmission from pets in general. What is hibernation and is my tortoise ready? My tortoise has never had a problem hibernating, why would it now? Unfortunately the poor summers we now experience with wetter weather and lower temperatures do not lend themselves to maintaining our pet tortoises outdoors successfully year-round. Mediterranean tortoise species need a long warm summer feeding on nutritious foods in order to build up enough reserves to last through hibernation. When we have wet, cold summers this stockpiling effect is not achieved as tortoise metabolism and appetite is much reduced in such weather. Because of this we often see post hibernation problems in tortoises with severely debilitated immunity in Spring, as well as in a catabolic or emaciated state suffering from anorexia on emergence. These cases often need aggressive veterinary treatment, including fitting of an oesophagostomy or feeding tube into the side of the neck. With careful planning and preparation, we can minimise the risk of these post-hibernation problems occurring. In the same way the springs we are having are often very cold and wet at precisely the time our tortoises are waking from hibernation and need warmth to kick start their metabolism back into action after their winter rest. How can I care for my tortoise during poor weather? Indoor accommodation is crucially important to have on standby throughout the year, especially in times when the weather is poor, in order that tortoises do not miss out on time for feeding and stockpiling energy reserves. Keeping adult Mediterranean species outdoors is acceptable throughout the summer months, but only when they are in good body condition and when the weather is suitable. If we have wet or cold weather for more than a few days in a row, it is vital that alternative indoor accommodation can be provided with supplemental heating in the form of a spot lamp as well as artificial ultraviolet (UV) lighting to replicate sunlight and allow synthesis of Vitamin D3 which is vital for calcium absorption and many other metabolic processes. An indoor pen is ideal although a greenhouse may suffice, but it is crucial to remember that even in a greenhouse a fluorescent UV light must be used as UVB rays do not pass through glass. If the greenhouse is to cold a heat lamp on a thermostat to prevent overheating should be employed. Similarly, even on relatively dull summer days a glasshouse can reach dangerously high temperatures for your tortoise so this needs to be monitored carefully. This accommodation is especially valuable in the preparation period before hibernating your tortoise as well as when they come around from hibernation or if you must wake them in Spring. This is because it allows a buffer environment between the hibernation quarters and the outdoor environment which may be entirely unsuitable for your tortoise at vital times such as the pre- and post-hibernation period. In the two to four weeks before putting your tortoise into hibernation several factors must be considered in order to minimise health risks over the winter. During the pre-hibernation period tortoises should be brought indoors and have their temperature and day length reduced gradually to mimic the onset of winter. During this time it is advisable to gradually reduce feeding and stop altogether approximately two to four weeks before hibernation proper depending on the size of your tortoise, with larger specimens needing longer to empty their digestive systems than smaller animals. This of course is if your tortoise is in reasonable condition and health to enter hibernation in the first place. If your tortoise enters this pre-hibernation induction period too early in late summer for example due to bad weather then it should have been brought indoors into artificial heat and lighting to maintain appetite and encourage it to remain active and feeding. Once the safe time has come to allow your tortoise to prepare for hibernation you can start the fasting and preparation period. By providing daily warm water baths in a shallow tray of water, the tortoise will undergo a purging period where it voids any further faeces and intestinal contents, thus having an empty gastrointestinal system for the duration of hibernation. If this process is not undertaken, the risk of fermentation of plant material in the gut and subsequent bacterial infection is higher. Temperatures during this time should be approximately 15-18 degrees Celsius in order to maintain digestive transit and effectively empty the digestive system. Also, daily bathing will encourage both active drinking and passive absorption of fluids into the gut via the cloaca or vent. Therefore bathing in the pre-hibernation period ensures maximum hydration status through the hibernation months, as well as having the desired effect of emptying the intestines of food material and the bladder of urates. How do I decide whether or not to hibernate my tortoise? All of these preparations should only be carried out on a healthy tortoise of the correct age, weight and size before considering for hibernation in the first place. I tend to advise against hibernating any tortoises under 5 years of age, or under 500g in weight. If your tortoise has any health issues or doesn’t meet the above criteria it may be advisable over wintering them instead of hibernating. Over wintering involves keeping the tortoise awake in indoor accommodation with heating and lighting over the normal hibernation period. This is critically important in very young or underweight animals, as well as those that have been sick or debilitated in the previous season, have had a particularly poor summer season without supplemental heating, or those that have current health problems. A vet visit for a pre-hibernation check is strongly advised for all but the most experienced tortoise keepers. The vet should check the tortoises muscle mass, eyes, ears, mouth and mucous membranes paying particular care to any breathing issues or discharges as well as checking their weight. 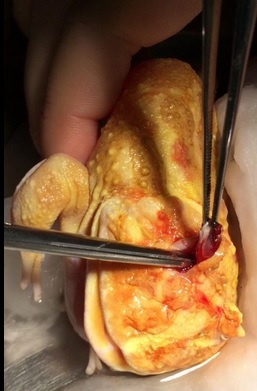 Reptile vets will often perform a routine parasite screen on a faecal sample to ensure a high parasite burden can be treated in time if present, thus preventing any gastrointestinal complications or dysfunction due to parasites in the post-hibernation period. In checking the weight of the tortoise, many vets will use a measuring chart plotting the animals weight compared with the length of the shell. This is referred to as the Jackson’s ratio and gives an indication of whether the tortoise is overweight, underweight or in the ideal weight category for it’s size. It is important to note however that this ratio is only useful in certain species and not in others due to variations in morphology and anatomy, and is most suited to assessing the Hermann’s tortoise and the Mediterranean Spur-thigh tortoises. How should I hibernate my tortoise? Hibernation facilities themselves need to be dry, cool, escape proof and safe for the tortoise to sleep in for several months. A ventilated wooden crate or strong cardboard box will often suffice, kept in a cool shed or outhouse as long as it is frost-free. It must also be checked for rodent damage on a regular basis as there have been cases of mice and rats gnawing on a hibernating tortoise over the winter period. The box or container should be loosely packed with shredded paper, card or hay and straw as long as it is dust-free. For more accurate control of temperature than a garage or shed, a small refrigerator kept at approximately 5 degrees Celsius is a worthwhile investment. The tortoise should be checked on a fortnightly basis, weighed and if stirring can be roused for a drink of fresh water. It should not lose more than 1% of total bodyweight over the hibernation period. How long should hibernation last for? The duration of hibernation is a topic which is open to much debate. In my view in order to complete a natural hibernation cycle the hibernation period should never exceed four months duration, but preferably about three months in order to minimise the risks. If hibernation is too long the animal may deplete much of it’s energy and fat stores as well as run the risk of becoming dehydrated. Therefore it may leave hibernation underweight and quite debilitated, and develop medical problems that can be difficult to treat such as pneumonia, abscesses or post-hibernation anorexia and hepatic lipidosis for example. If hibernation is too short then the tortoise may not complete the natural metabolic processes that occur during the winter dormancy period and may be difficult to rouse in the Spring. Because of our weather conditions and cold wet Springs in recent years, it is easy to see why a buffer zone or indoor facility to keep the tortoise warm especially in the post hibernation period is vitally important. A tortoise that enters hibernation in early November will need to roused artificially in early March and if we have a cold, wet spell for several weeks into April an outdoor tortoise will not begin to feed again, so may very well succumb to opportunistic infections or other illness. The days of waking the tortoise up after six months hibernation and hoping for good weather in the garden are gone unfortunately so we need to alter our husbandry techniques accordingly. The above patient of mine had pneumonia, ocular and aural abscesses in the post-hibernation period. I treated aggressively with an oesophagostomy feeding tube, antibiotics, nebulisation and supportive care including fluid administration, and he eventually made a full recovery. What if I don’t want to hibernate my tortoise? Many owners opt not to hibernate their Mediterranean tortoises at all in order to minimise or indeed eliminate the risks associated with this process. Although certain species hibernate or at least become semi-dormant in the wild depending on their range and climate, it is not vital for survival for these species to hibernate in captivity. Some argue however that preventing this natural process can impact on longevity or even overall health in the long term, although the evidence for this is not well established. As a side note some tortoise species never hibernate in the wild and to force this in captivity would almost certainly result in death. The tropical species of tortoise such as Red-footed tortoises, African Sulcatas and Leopard tortoises are examples of those that should never be hibernated. Of course before acquiring any species of exotic pet, one should always have done extensive research into their natural history and care, and therefore be well aware of such requirements. How can I over winter my tortoise safely if I choose not to hibernate? If choosing to over winter your tortoises instead of putting them into hibernation, there are a few rules you should follow. As mentioned above, any animal that is underweight, has had a serious illness that season, is currently ill or one that has not had a period of several months duration of good sunny weather in order to build up energy stores must be over wintered. Adequate temperatures must be maintained to keep the animal active and eating during this time, and will depend on the facilities available to you. A tortoise table or indoor pen is preferable to a glass-fronted, vented vivarium as the former options are better ventilated. A thermostat and spot lamp is perhaps the safest and most effective method of heating your indoor tortoise enclosure. Temperatures can be at the lower end of the species preferred optimal temperature zone (POTZ) during the winter months, but mustn’t fall too low that they discourage normal feeding behaviour. Equally as important as indoor heating is the provision of artificial UV lighting to simulate natural sunlight. The long tubular fluorescent UV lights are preferable to the compact or coil UVB bulbs, or indeed the combined heat and UV bulbs which focus a concentrated beam of UVB exposure in just one area of the enclosure. A day: night cycle of 12 hours light and 12 hours darkness can be maintained using an inexpensive automatic timer. Normal feeding should be maintained over the winter period, with a variety of leafy greens, grasses, weeds, herbs and a small amount of mixed vegetables. Fruit should only ever be given as a very occasional treat to Mediterranean tortoises. Appropriate supplementation with a good quality calcium supplement, as well as a combined multivitamin and mineral supplement should be used to correct or prevent deficiencies in the diet, and should be tailored to the dietary provision, age and condition of the species in question. Finally, whether you choose to hibernate or over winter your pet tortoise, if you notice any behavioural changes or signs of illness mentioned above that you are unsure about I strongly recommend a vet visit at your earliest convenience. Tortoises and indeed many reptiles are masters of disguise when it comes to illness and will often be in advanced stages by the time an illness in noticed. I’m often presented with very sick tortoises in Spring that have had a very bad hibernation and are suffering from chronic debilitation and disease by the time an owner brings them in. Some of these should never have been hibernated in the first place. They are then extremely challenging (and often expensive!) to provide successful treatment for when they are woken up and fail to bounce back from their winter slumber. So I would strongly urge at this time of year making a visit to your local reptile or exotics vet for a pre-hibernation check up. In a pet tortoise that can outlive yourself and even your children or grandchildren, this quick check up is an important annual appointment that can pick up on problems before they become too serious. Similarly, if your tortoise refuses to eat or appears sluggish for a few days after rousing from hibernation, despite having access to artificial heat and light then an urgent vet visit is strongly recommended in order to address any issues and start prompt treatment if necessary. Sean McCormack BSc (Hons), MVB, MRCVS. Pedigree Dog Welfare: Buyer Beware! Step right up! Behold a Two-headed Snake!